Economic Freedom Report 2010; Where does Nepal stand? Economic Freedom is described as the situation where people of a country are free to trade with others, compete in markets, buy what they want, earn a living in a job they choose, keep what they earn and own things privately. Among the three kinds of freedom (political, civil and economic) , economic freedom is considered the most crucial factor for the development of a country and the most ignored one. For example , in Nepal's case, we all are aware of our political freedom and civil liberties but not only we are ignorant about our economic freedom rights but in most cases, we tend to think those rights irrelevant and not rights at all. From a ordinary citizen to policy makers of our country are hostile to foreign investments, free labor markets,consider imports to be harmful for our country and are ambiguous while dealing with taxation policies, private properties, free trade and free competition and government's intervention in Nepalese economy. Average Per Capita Income of the freest countries is $ 24,402 whereas average per capita income of least free countries is $ 2,998. Life expectancy of most free countries is 77.8 years whereas that of least free countries is 55 years. Note the fact that some countries among the freest one are devoid of any natural resources, like HongKong and Singapore whereas most of the countries among the least free ones are considered to be very rich in natural resources, like Nepal, Congo, Venezuela. 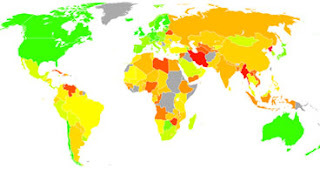 Economic Freedom Index is calculated by two institutes separately. Fraser Institute of Canada and Heritage Foundation of USA. Following is the section about Nepal in Heritage Foundation's Economic Freedom Report 2010. Nepal’s economic freedom score is 52.7, making its economy the 130th freest in the 2010 Index. Its score is 0.5 point lower than last year, reflecting declines in five of the 10 economic freedoms. Nepal is ranked 28th out of 41 countries in the Asia–Pacific region, and its score is below the world and regional averages. Nepal’s economy is characterized by a combination of rapid population growth and inadequate economic growth that has led to widespread, chronic poverty. Overall, weak reform efforts have failed to stimulate broad-based economic growth. The state continues to hamper private-sector development, and political instability weakens the country’s ability to implement economic reform or create a stable environment for development. Although reforms in Nepal’s trade regime are slowly having an effect, the average tariff rate remains high. Foreign investments must be approved or face licensing requirements. A lack of transparency, corruption, and a burdensome approval process impede much-needed private investment growth. Property rights are undermined by the inefficient judicial system, which is subject to substantial corruption and political influence. Background: The fall of the nine-month-old Maoist government in May 2009 has led to political uncertainty in Nepal. Maoist leader Pushpa Kamal Dahal resigned from the premiership following a dispute with Nepal’s president over leadership of the army and the fate of some 20,000 Maoist fighters. A 22-party coalition led by Communist Party of Nepal (United Marxist Leninist) leader Madhav Kumar Nepal took power following the fall of the Maoist government but faces continual protests and weakening law and order. The Maoists, who fought a 10-year insurgency that left over 13,000 dead, signed a peace accord in 2006 that allowed for elections that they won in 2008. Economic development has largely stalled. Nepal attracts very little foreign direct investment, and its main industries are agriculture and services. The overall freedom to start, operate, and close a business is limited under Nepal’s regulatory environment. Starting a business takes an average of 31 days, compared to the world average of 35 days. Obtaining a business license takes almost twice the world average of 218 days. Bankruptcy proceedings are lengthy and complex. Nepal’s weighted average tariff rate was 13.1 percent in 2007. The government continues to implement reforms, but import bans, services market access barriers, import taxes, import and export licensing, non-transparent regulations, weak enforcement of intellectual property rights, inadequate infrastructure and trade capacity, and customs corruption add to the cost of trade. Fifteen points were deducted from Nepal’s trade freedom score to account for non-tariff barriers. Nepal has moderate tax rates. Both the top income tax rate and the top corporate tax rate are 25 percent. Other taxes include a value-added tax (VAT) and a property tax. In the most recent year, overall tax revenue as a percentage of GDP was 9.6 percent. Total government expenditures, including consumption and transfer payments, are low. In the most recent year, government spending equaled 16.0 percent of GDP. The state oil company is a drain on the economy. Inflation has been moderately high, averaging 7.4 percent between 2006 and 2008. Although most price controls have been eliminated, the government regulates the prices of petroleum products and telecommunications services and subsidizes companies in strategic sectors. Five points were deducted from Nepal’s monetary freedom score to account for policies that distort domestic prices. are burdensome, non-transparent, inconsistently implemented, and inefficient. Political instability, pervasive corruption, and inadequate infrastructure and administrative capacity also inhibit investment. Residents may hold foreign exchange accounts in specific instances; most non-residents also may hold such accounts. Convertibility is difficult and not guaranteed. Most payments and transfers are subject to prior approval by the government. There are restrictions on most capital transactions, and all real estate 100 transactions are subject to controls. Foreign investors may most free acquire real estate only for business use. Nepal’s fragmented financial system is heavily influenced by the government. Financial supervision is insufficient, and anti-fraud efforts are lacking. Regulations are not transparent and fall short of international standards. The banking sector dominates the financial sector, and there are approximately 20 commercial banks operating in the country. The number of other financial intermediaries has increased in recent years, but the high cost of credit and limited access to financing still deter entrepreneurial activity. Nepal’s government-owned banks represent more than 30 percent of total banking assets and account for more than half of total bank branches. The central bank has gradually phased out “priority sector” financing activities whereby banks must lend a certain amount to government-designated projects. Nepal’s judicial system suffers from corruption and inefficiency. Lower-level courts are vulnerable to political pressure, and bribery of judges and court staff is endemic. Weak protection of intellectual property rights has led to substantial levels of optical media copyright piracy. Corruption is perceived as widespread. Nepal ranks 121st out of 179 countries in Transparency International’s Corruption Perceptions Index for 2008. Foreign investors have identified corruption as an obstacle to maintaining and expanding direct investment, and there are frequent allegations of official corruption in the distribution of permits and approvals, the procurement of goods and services, and the awarding of contracts. The governmental Commission for the Investigation of the Abuse of Authority, mandated to investigate official acts of corruption, claimed a 75 per-cent success rate concerning corruption cases it filed, but some cases involving politicians were not filed or were defeated in court. Nepal’s labor regulations are restrictive. The non-salary cost of employing a worker is low, but laying off an employee is difficult. Isn't it time that we fight for our economic freedom as well? ?